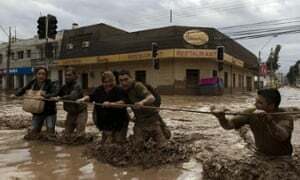 The president of Chile has flown to the Atacama region in the country’s north where freak rains and flooding left at least seven people dead and others needing evacuation by air from swamped homes. Communities in the desert region were struggling on Thursday to cope with a disaster that knocked out power and cut off roadways. Thunderstorms with torrential rains moved into the Atacama on Tuesday, causing the Copiapo river to overflow its banks. Fears of mudslides prompted authorities to evacuate thousands from their homes in “the worst rain disaster to fall on the north in 80 years,” said the deputy interior minister, Mahmud Aleuy. 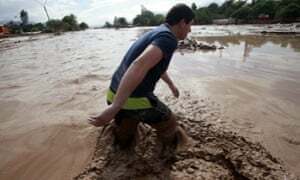 TV images showed brown muddy waters flooding the streets and reaching a hospital in Copiapo city. Some people living along the river had to be rescued by helicopter because roads were blocked by water and mud. TV footage showed several families waiting on the roofs of their homes, including a man who had punched a hole through his roof to save his toddler. As well as the 7 dead, 19 people were listed as missing in three communities hit by flooding, officials said. The heavy rains came after several days of high temperatures and a drought that stoked raging wildfires in Chile’s south-central regions. The fires have burned nearly 93,000 hectares in the 2014-2015 season, far above the annual average of 59,300 hectares over the previous five years. Earthquake-prone Chile is no stranger to the forces of nature. The national geological service Sernageomin said residents should be on alert due to increased activity at the Villarica volcano in the country’s south, which erupted on 3 March, forcing evacuations and disrupting air traffic. The storms prompted Chile’s state-run copper giant Codelco to suspend work due to blocked roads. The company said on Thursday it was reopening sites in the north, including some of the world’s largest copper mines.